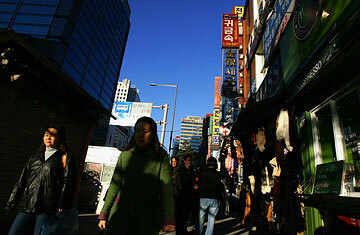 Will High-Heel-Friendly Streets Keep Seoul's Women Happy? By 2010, Seoul's women should officially be happy  at least the ones with driver's licenses. In May, the city government started to paint 4,929 public and private parking places pink throughout the city, with thousands more slated to go under the brush next year. The pink parking spots, reserved for women drivers so they don't have to walk so far to work or the mall, are part of the South Korean capital's Women Friendly Seoul Project, an effort for the notoriously macho Asian city of more than 10 million to transform itself into a safer, more heel-friendly "space for women." A nice idea, but the plan may end up reasserting South Korean women's secondary status more than boosting it. Led by Mayor Oh Se Hoon, the $104 million program launched in 2007 under the slogan "Happy Women, Happy Seoul," with a focus on mothers of young children and the unemployed. Assistant mayor of women and family policy affairs Cho Eun Hee says the program will be, among other things, helping to find work for jobless women, paving streets to make them high-heel friendly, building more women's public restrooms, improving lighting in public spaces, creating safe parks for women, expanding a women's taxi service and adding more public day-care centers. Cho says the project aims to eliminate "the inconveniences, anxiety and discomfort that women in Seoul experience on a daily basis." It's not that working women in South Korea couldn't use the help. Though South Korea is Asia's fourth largest economy, only about half of its women have full-time jobs; in June, nearly 10 million women were employed nationwide, according to the National Statistics Office, compared to almost 14 million men. In Seoul, many women work infamously long hours, with employers offering few systems to help working mothers keep a manageable balance between their jobs and families. "Because of the very high price of child-rearing in Korea, it may prove more economical to stay behind helping children to do better in the school," says Professor Chang Pil Wha of Seoul's Ewha Womans University. Finding a job after maternity leave can also be an uphill battle. While Seoul's project may help women "worry less about harassment or violence," Chang says, "the question remains about how to share the household chores and responsibilities" so that women can more freely enter  and stay  in the labor market. Eunyoung Cho, a 25-year-old who will be leaving Seoul this fall to pursue a degree in economics at the University of California, Davis, also questions its efficacy, saying the project seems more political than personal. "The policies make the citizens feel that their mayor is doing something, but they do not feel the changes in their lives," Cho says. "President Lee Myung Bak got huge political fame during his term as the mayor of Seoul. He reformed the public transportation system and constructed a big park in the center of the city. I guess Mayor Oh wants to follow in President Lee's footsteps." To be fair to the mayor, President Lee hasn't done much either to improve a better sense of gender equality in South Korea. In the 2007-08 Gender Empowerment Measure of the United Nations Human Development Report Office, South Korea ranked low at 64 out of 93 countries. James Turnbull, who writes about Korean gender issues in his blog, Grand Narrative, says that at an Emergency Economy Management Council meeting in January, Lee was quoted by the press as saying, "The most urgent issue on our hands is to create jobs for the heads of households." In other words: men. In 2008, Lee considered dissolving the government's Ministry of Gender Equality, established in 2002 to promote women's rights, into the Health and Welfare Ministry, a move that he backed off from when it ran up against criticism. Cho, the economics student, hopes to eventually return to South Korea as a professor, a position that would enable her to pursue a career and, one day, a family. But she knows that other Korean women may not be as lucky, and their needs aren't being met by a plan that accommodates shoe choice over equal opportunity in the workplace. "They are saying that they are doing many things for women, but we do not see any noticeable changes," she says. "They are wasting citizens' money out of the tax that they pay. We don't want pink parking spots." What South Korean women do want, says Cho, is to see more choices for child care so that they don't lose jobs to men when they have families. And a few more female taxi drivers wouldn't hurt either. Read about Kim Jong Il's secret family.